Comandos de Salvamento was founded in “Villa Delgado” which is now called Ciudad Delgado in the early 1960s. 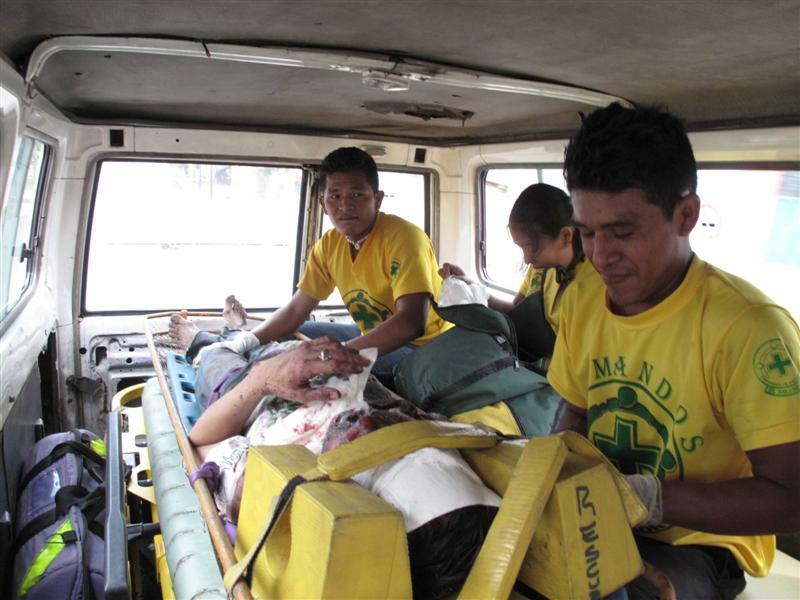 The idea was started by a progressive group of Salvadoran citizens that wanted to form a public Ambulance/Rescue service that would serve all people regardless of Religion, Race, Color, Economic level, or Political creed. 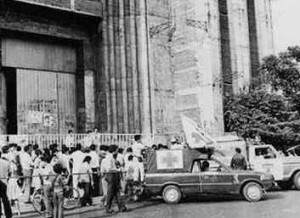 During the funeral of Archbishop Oscar Arnulfo Romero at the downtown cathedral in March 1980 the Comandos were one of the institutions that offered emergency aid to victims that had been fired upon by soldiers from other buildings surrounding the cathedral. 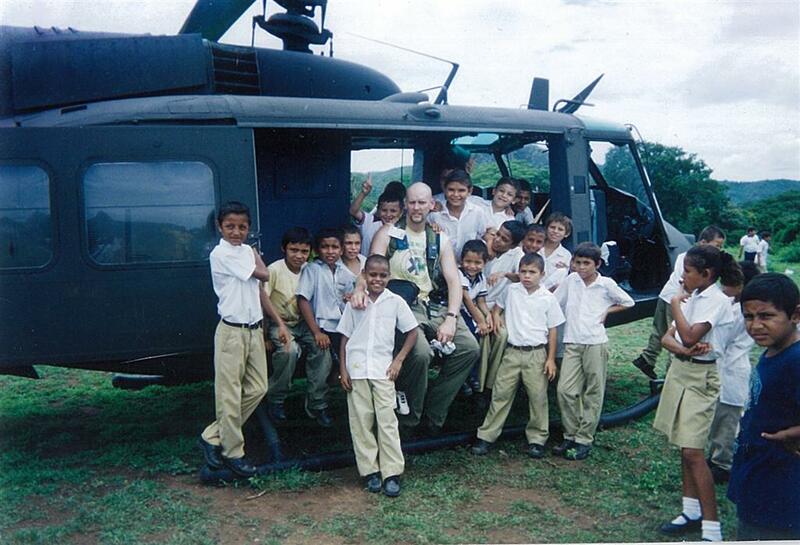 This event opened the doors for the Comandos de Salvamento to obtain international aid. During the early eighties, another institution was created called the Green Cross. 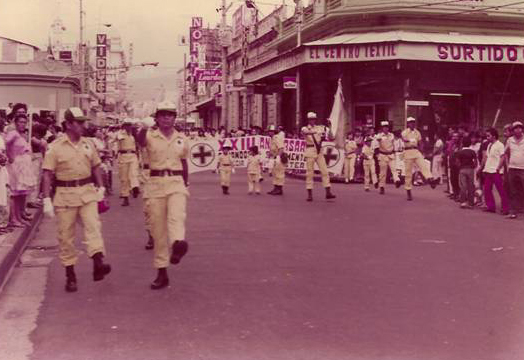 The Comandos de Salvamento and the Green Cross used the same emblem and uniform. In order not to cause confusion for the Salvadoran people and International Community; the director of the Diario del Hoy held a meeting with the leadership of each institution. 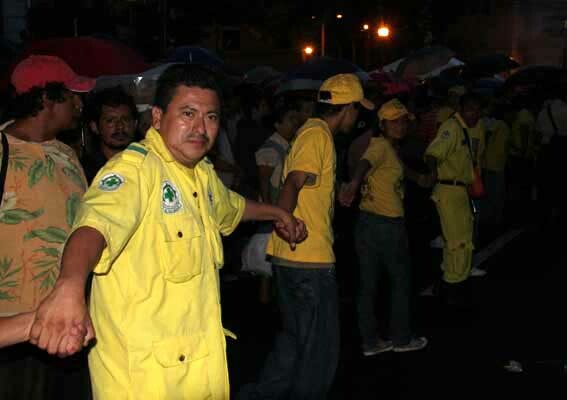 As a result, the Green Cross changed their uniform to white and the Comandos de Salvamento continued to use yellow with the emblem of a green flag surrounded by a symbol of solidarity. 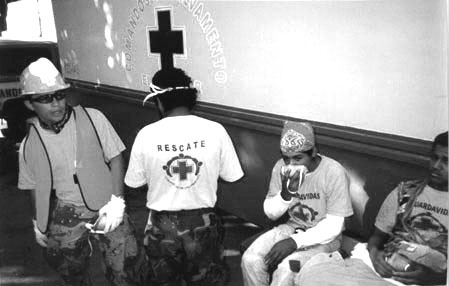 For nearly 60 years, El Salvador has been witness to the excellent work, and humanitarian service of the Comandos de Salvamento; helping those in need during times of traumatic situations. In the 1960s there were two important events that the Institution were involved in. On May 3, 1965, an earthquake hit San Salvador destroying many public buildings and thousands of people were left without housing and water. In 1969, a border dispute between El Salvador and Honduras resulted in the “100 hour,” or “Futbol War” near the Honduran border areas of El Poy in Chalatenango, and Amatillo in the Eastern part of the country. In the 1970s the first disaster happened in 1974 when Hurricane Fifi flooded cultivated agricultural areas in central and eastern parts of El Salvador. 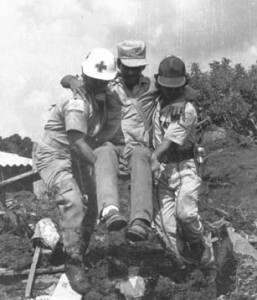 In 1976, Comando volunteers went to Guatemala to coordinate rescue efforts for victims of an earthquake with the National Fire Department of Guatemala. 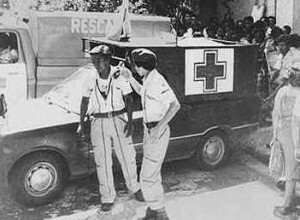 Near the end of 1979 the Comandos de Salvamento offered first aid to anyone injured during confrontations between the Government Army, and social reform groups like the Lp-28 and Bloque Popular. 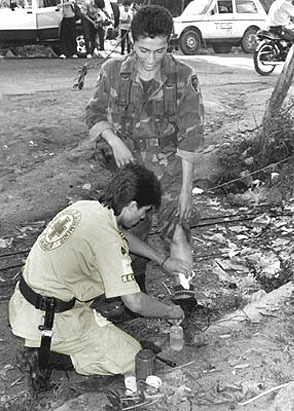 During the 1980s, El Salvador found itself in a Civil War which made it very difficult for humanitarian work in conflictive areas. During this time the FMLN Guerrillas and the Salvadoran Armed Forces did not trust the humanitarian work of the Comandos de Salvamento. Later, during the course of the War, each side began to understand the neutral position of the Comandos de Salvamento. 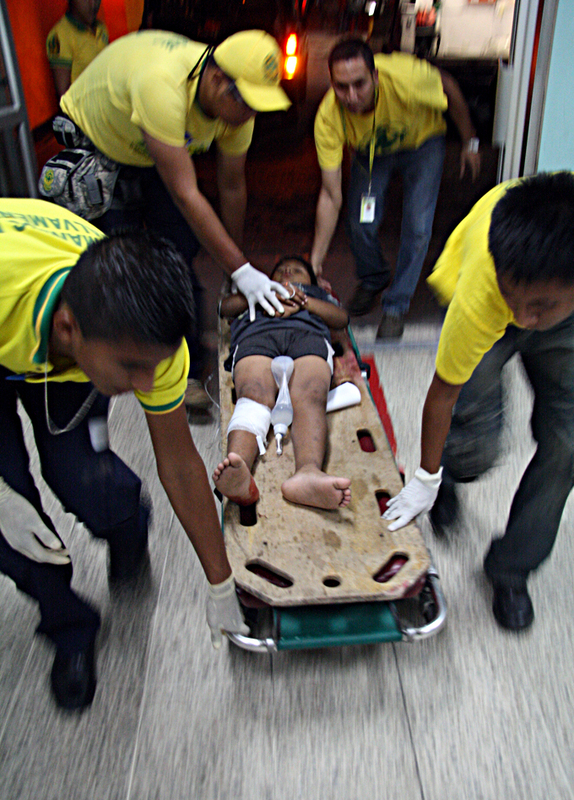 This is the belief that each person has the right to medical aid whether it be civilian, a Salvadoran infantry Soldier, or an F.M.L.N. guerrilla. At the beginning of the conflict, this misunderstanding and conflict of interests cost the lives of more than thirteen Comando de Salvamento volunteers. See Neutrality document for more information.Like the fury of man during the civil war, the fury of mother nature also manifested itself during the 1980s. In September 1982 during the rainy season, a giant mudslide buried several neighborhoods in the Colonia de Montebello Poniente. This resulted in approximately 450 deaths and many stranded without housing. 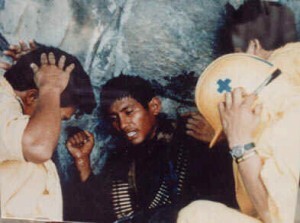 The Comandos worked in the area for over a month rescuing survivors and searching for cadavers. 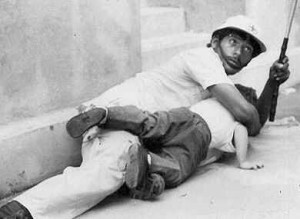 In 1986 a huge Earthquake hit San Salvador causing hundreds of deaths, damage to buildings, and leaving an uncountable number of people stranded without food or shelter. 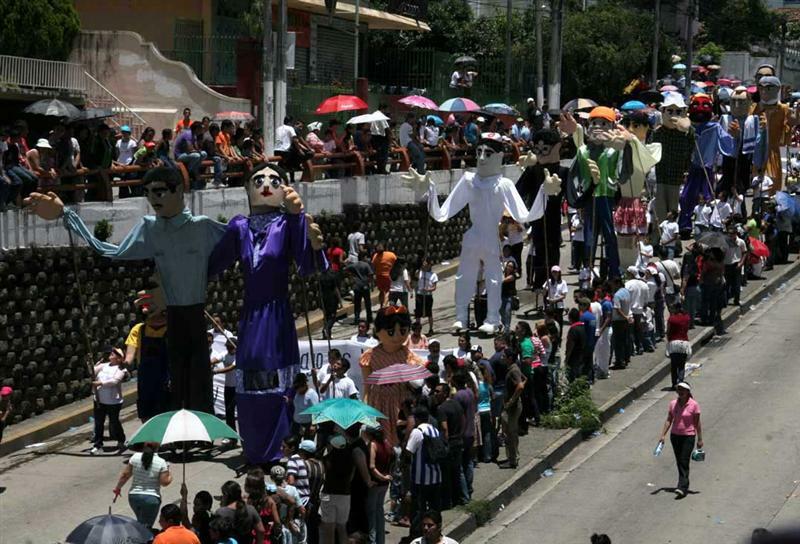 This caused more social and economic problems for El Salvador. But this event did not stop the gunfire, bombing, and massacres that were still taking place outside the capital in conflictive zones. 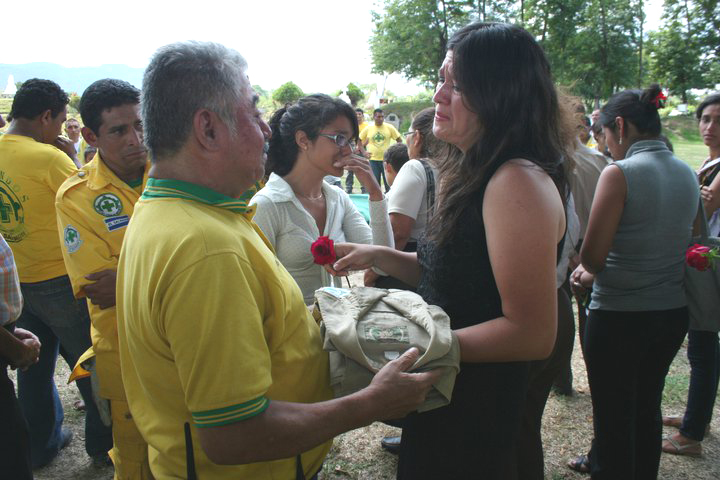 In November 1989, the final culmination of social and economic problems in El Salvador was manifested through the strongest F.M.L.N. Guerrilla offensive that the country had ever been witness too. 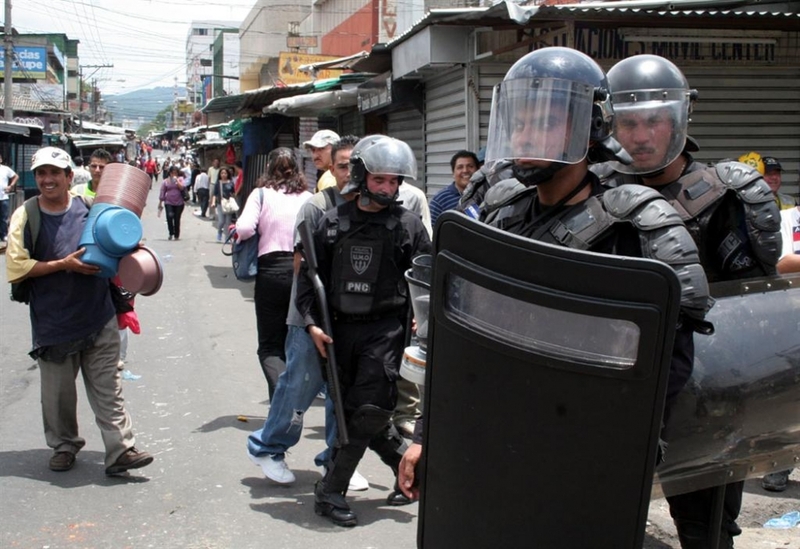 War had come to the capital of El Salvador. In 1992 the Chapultepeq Peace Accords were signed by leaders of the F.M.L.N. and the Salvadoran Government. Both sides began to work and are still working together to rebuild the country after twelve years of War. This began a time of restoration and peace; but also began a time that the Comandos de Salvamento and Salvadoran society in general, were not prepared for. Post-War El Salvador. 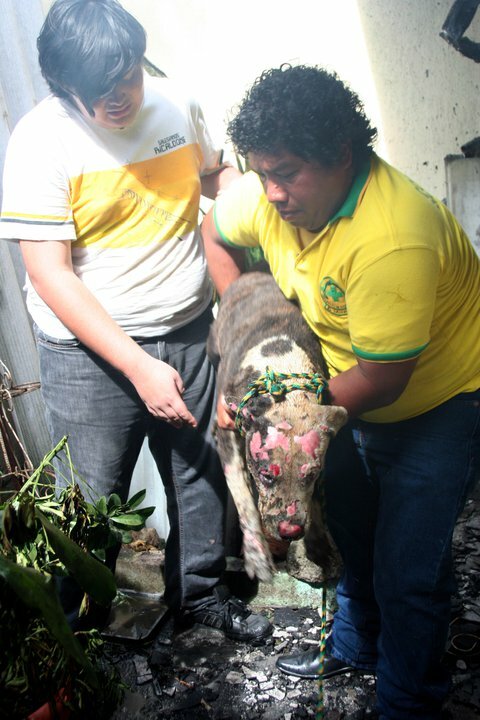 Right now a different type of war is taking place in El Salvador. Due to a destroyed infrastructure, economic unrest, social problems that still exist, and due to problems manifested by the past civil war; extreme violence, crime and delinquency has gone up. Salvadorans who once fled El Salvador during the war are deported and sometimes bring the gang cultures of the U.S. back with them creating a huge societal problem. Current statistics state that more people die now from violence than did during the Civil war. 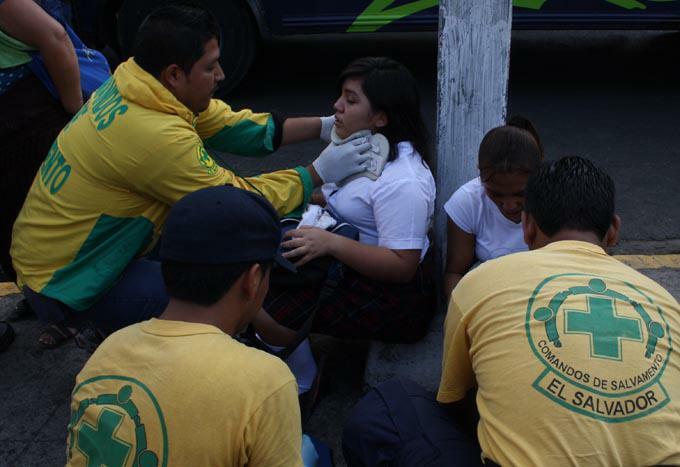 Traffic accidents and natural disasters are always happening in El Salvador as was made clear when Hurricane Mitch hit Central America in 1998. the most recent episodes were the January and February Earthquakes of 2001. 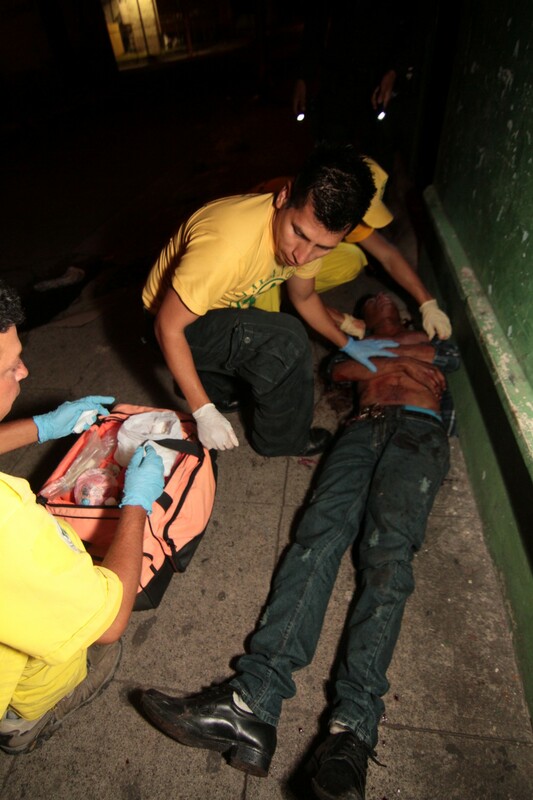 Currently the Comandos de Salvamento are developing educational programs on disasters, and basic first-aid. The Comandos de Salvamento receive financial and humanitarian help from a variety of sources including PEOPLES POPULAR AID This Norwegian organization is currently supporting the Comandos in the education and training of communities in high risk areas for natural disasters. 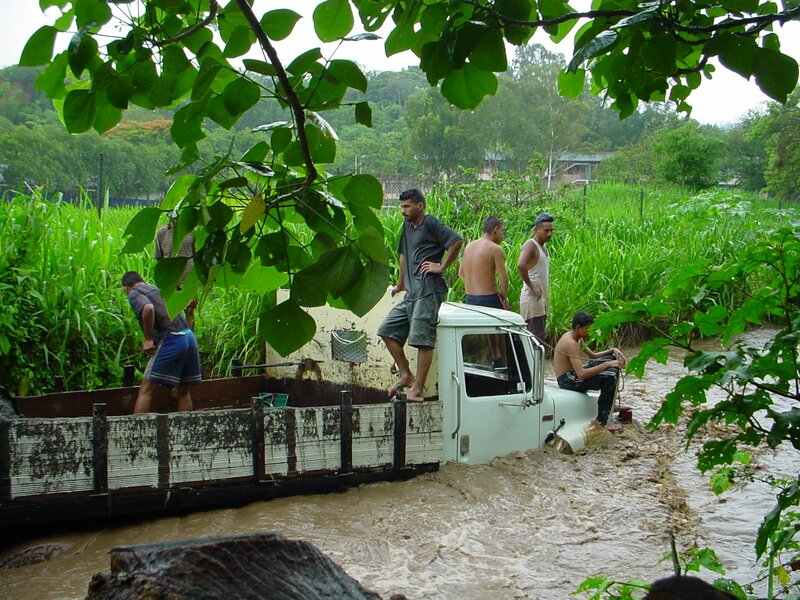 Bajo Lempa has been one of these areas affected by severe flooding over the years. The Comandos are very proud and grateful for the Solidarity demonstrated by the People of Norway to help Salvadorans overcome these life-threatening situations. Since 1998 the Comandos de Salvamento have also been supported by the Government of El Salvador in the development and growth of the institution. Helped troops in the evacuation of injured. 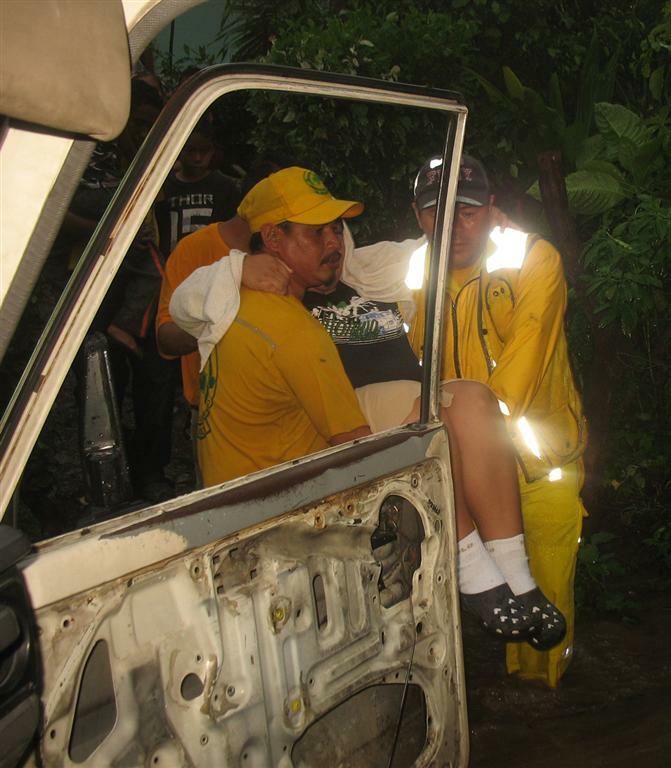 Search and rescue of victims in coordination with volunteer firemen, helped distribute food, clothing, and medicine. Offered first-aid and transported religious and public citizens that were killed and injured on the steps of the Cathedral. In coordination with the Emergency Medical System of Mexico, fifty Comando volunteers were sent to help in search and rescue efforts of victims. 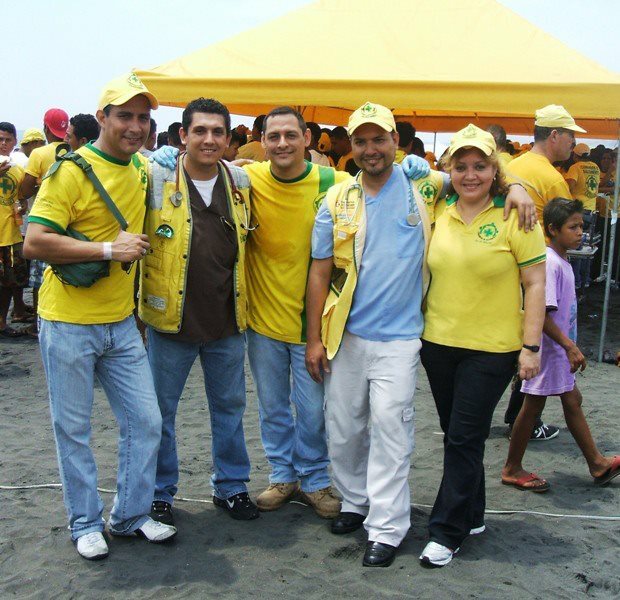 Worked in coordination with the National Emergency Committee in search and rescue efforts of victims and brought medical assistance to all affected, distributed food, clothing, building materials, and water in coordination with the directives of the communities, the total number of people attended by Comandos de Salvamento were 475,000. Comandos evacuate the communities of Nueva Esperanza, Ciudad Romero, y Nuevo Amanecer; during this time in Bajo Lempa there only existed these three communities. Damage and loss was considerable; including crops, livestock, housing, and personal belongings. No deaths were reported, but 7,000 were affected. 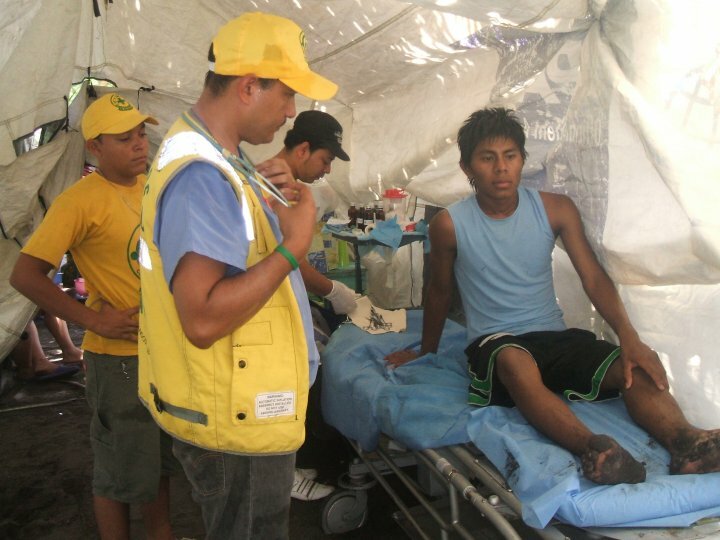 Food, clothing, and medical assistance were distributed. Comandos, the Armed Forces, the National Civilian Police and the National Emergency Committee coordinate search and rescue efforts as a result of the accident, We stayed until the last cadaver was evacuated. Storms and hurricanes leave 40,000 victims in these communities. Economic loss is valued at more than 30 million colones. Agricultural production, livestock, shrimp larvae crops, and housing is destroyed. Water raises over the principal highway four meters in eight hours. No human lives are lost. After the emergency,respiratory,intestinal, and skin problems rise. 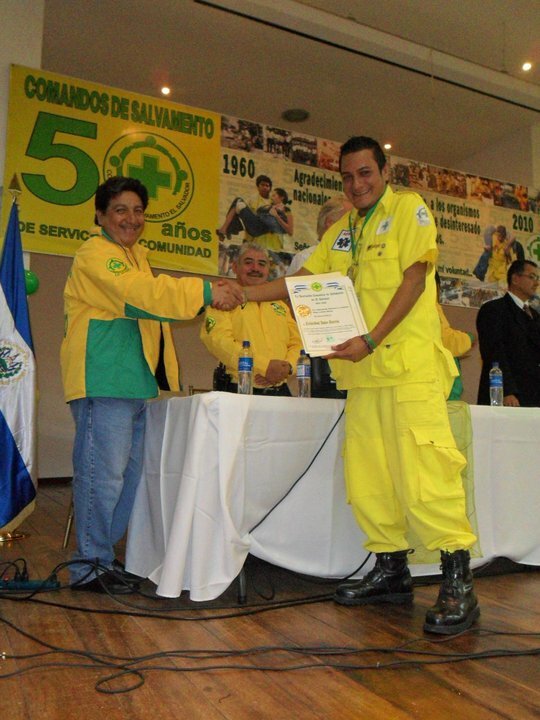 Comandos de Salvamento coordinate medical brigades in coordination with the Ministry of Public Health. 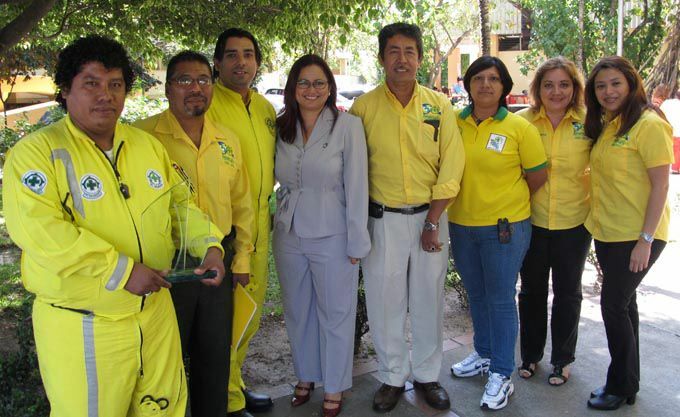 A national plan of Emergency is coordinated between the Comandos de Salvamento, the Ministry of Public Health, and the National Emergency Committee with the purpose to eradicate the mosquito that carries the dengue and hemmoragic dengue virus. 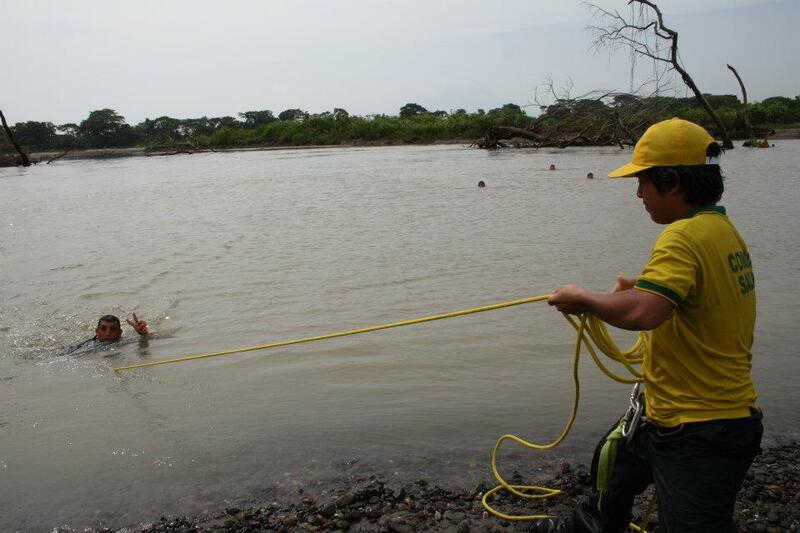 Comandos de Salvamento coordinate rescue efforts with the Armed forces in Evacuation of the communities of Bajo Lempa and Chilanguera. September/October Comandos de Salvamento assist communities in the Bajo Lempa areas of Usúlutan y San Vicente due to heavy flooding. Earthquakes January and February, Las Colinas Landslide, Santa Tecla. Rain Storm and Flooding: Assisting refugees, search/recovery of the dead.